Butterscotch spice cookies are a great alternative to traditional holiday cookies like gingersnaps. 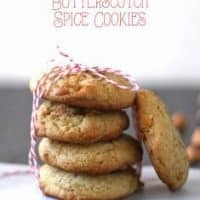 They still have the spice but are softer and delicious! After my crazy pomegranate cake last week, Mr. B’s sweet tooth had a hankering for cookies. I thought he would eat the bag of Halloween candy that is still sitting on the dining room table… or maybe something without sugar. So. Much. Sugar. I’ve been feeling under the weather so it just made sense to bake more. Baking is great for sick food bloggers. You get to leave whatever you’re making in the oven for a number of minutes and relax. Drink some tea. Blow your nose. Wash your hands 10,000 more times. With cooking, you’re always stirring, adding salt/spices, tasting to see if you need to add more salt/spices. I made the first 4 dozen cookies, not sure how they would taste. I have become more and more experimental with my dry ingredients and wet ingredients – quantity wise. Sometimes a small change can really make the difference between a good recipe and a great recipe. And a very bad recipe too. 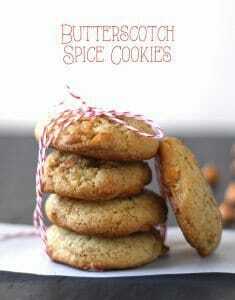 Well, Mr. B. came in the kitchen, ate one of these butterscotch spice cookies and then proceeded to go to town. I knew I was planning on making the recipe again (recipe quality control and all) so I didn’t stop him. Until I figured out that he was just going to keep eating and eating them. Had to put the kibosh on the cookie massacre that was happening in my kitchen so I could go rest again. And so the cookies didn’t become dinner. I don’t love butterscotch on its own but a little spice makes me want to eat it in large amounts (Mr. B too – see above.) 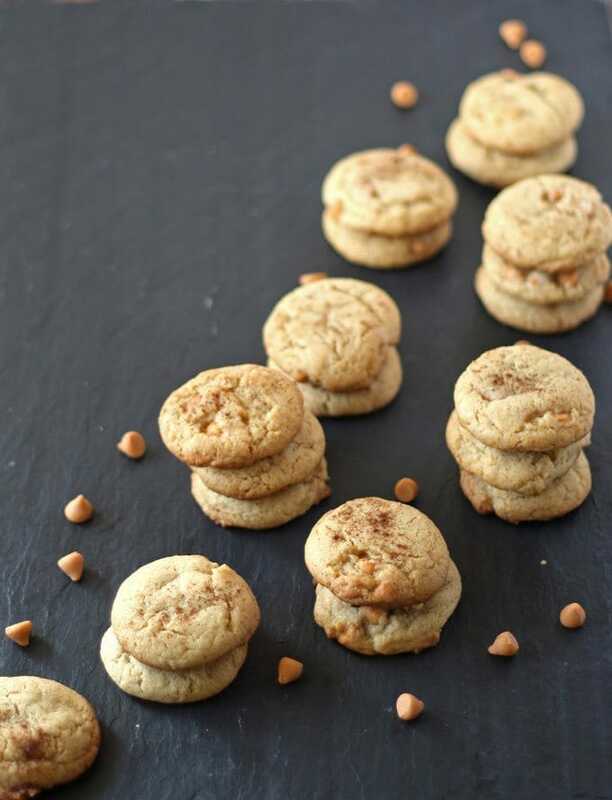 The spice comes in the form of ground ginger in the cookies and cinnamon sprinkled on top. Yuuummm. I originally started out wanting to make gingersnaps and then realized I didn’t have any molasses. Oops. 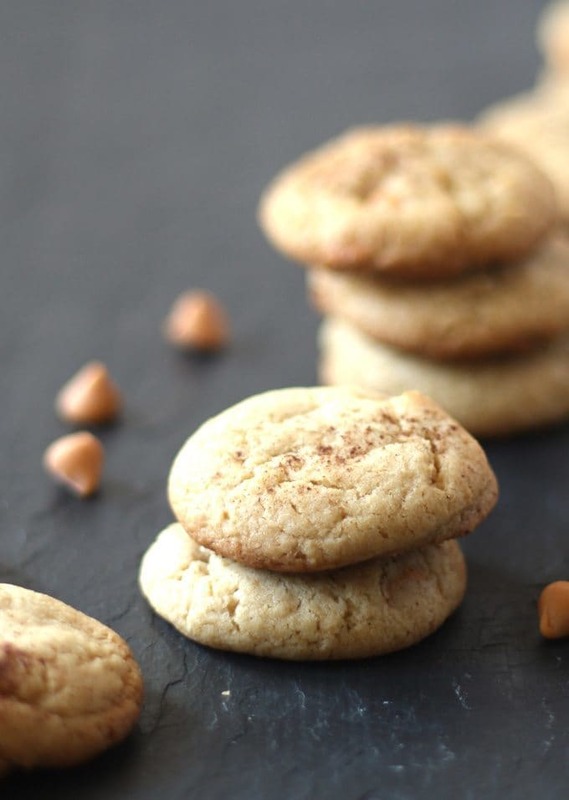 That’s okay – these cookies are a happy replacement for gingersnaps this holiday season. In a medium bowl, combine the flour, baking soda, baking powder and ginger with a whisk. Set aside. In the bowl of a stand mixer, cream together the butter and sugars on medium speed. Then add the egg and vanilla extract. When that is well mixed, reduce the speed to low and add the milk. After 1 minute increase speed to high for 2 minutes. Add the set aside flour mixture to the stand mixer bowl and mix on low. When the dry mixture is wet, turn off mixer. Fold the butterscotch chips in using a spatula. Then wrap the dough in plastic wrap and refrigerate for 30 minutes. While the dough is chilling, preheat oven to 375 degrees F. Line 4 cookie sheets with parchment paper or a silicone sheet liner. When dough is chilled, use a tablespoon to measure out the dough. Put the cookies on the sheet at least 1 inch apart. Sprinkle the tops of the unbaked cakes with a very small amount of cinnamon. 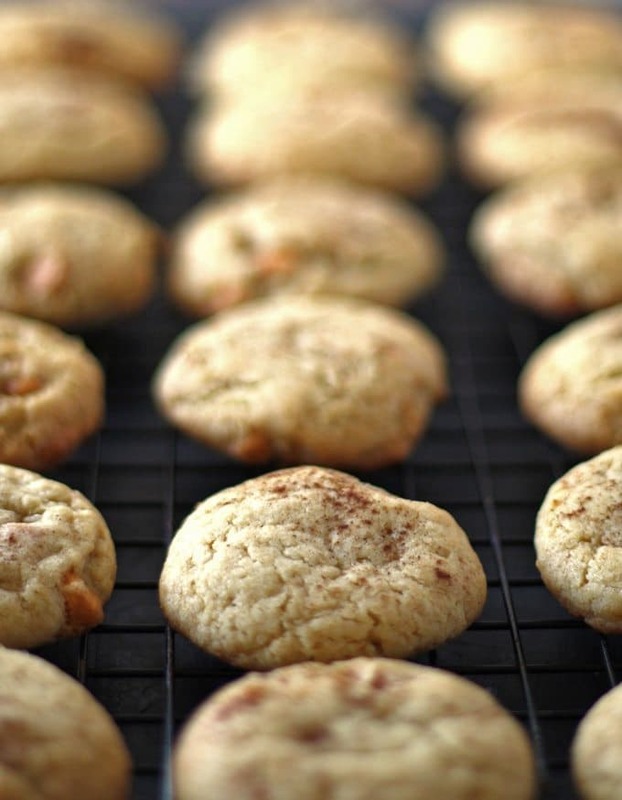 Then bake for 10 minutes, or until cookies are turning brown on the edges. Remove from oven and cool for 2 minutes on baking sheet, then transfer to cooling rack until completely cooled. 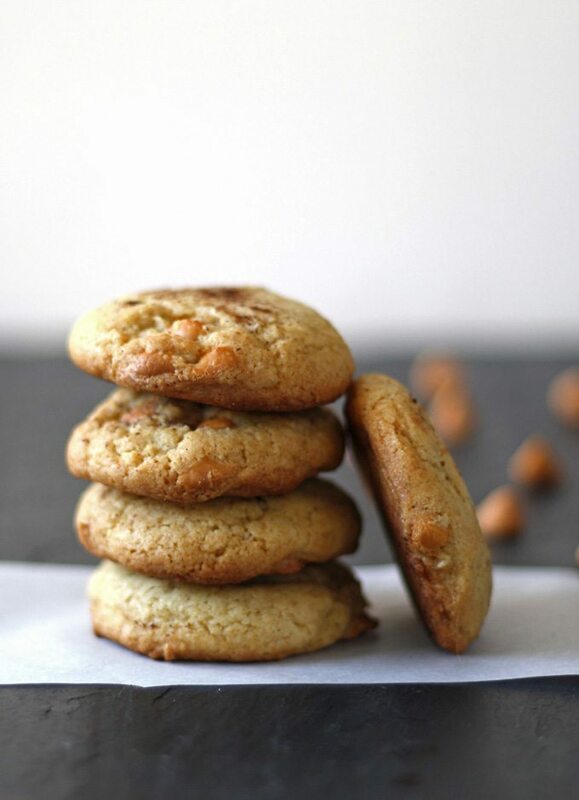 Check out my recipes for duck fat chocolate chip cookies or walnut cup cookies – all three of these recipes would make for a very delicious sweets table at your Christmas gatherings.